A film 400-foot-long, 50-foot-high advertisement adorning the front of a cinema in London has been described as 'classist' and 'racist'. 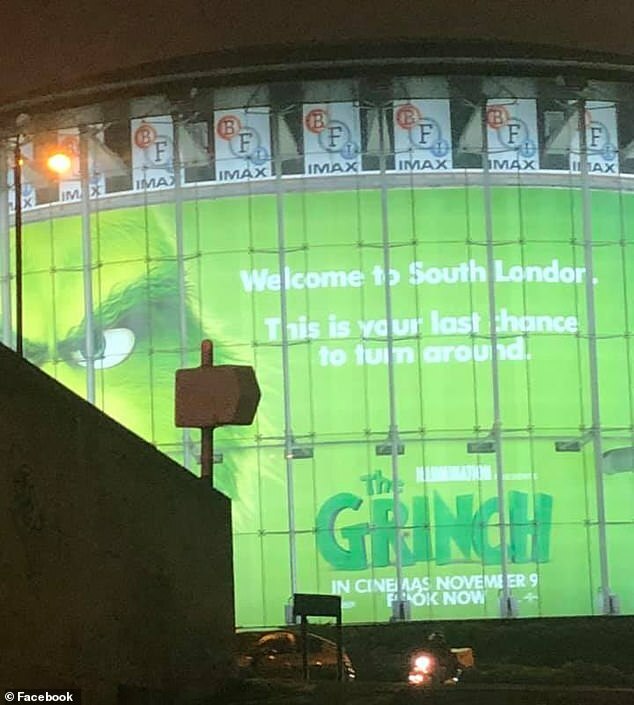 The message ran alongside a huge advertisement for the new Grinch movie that IMAX is showing. The advertisement seems to have offended quite a few people, with a slew of comments denouncing it online. One man even likened the advertisement to 'racist' and 'classist' attitudes. 'Nope. Not finding this funny @BFI Imax Waterloo - snobbery of South London is based on classist and racist stereotypes. 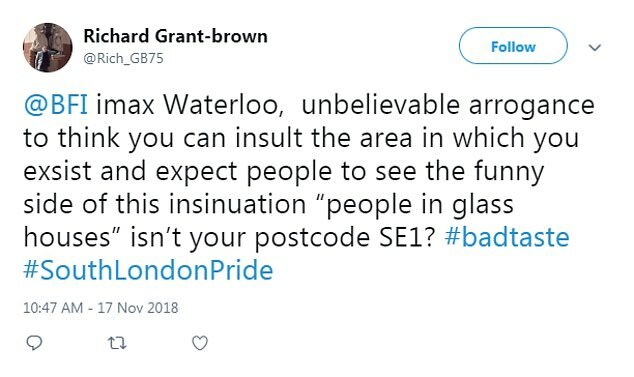 'Genuinely tried hard not to be a Grinch about this but too much #SouthLondonPride'. Some people said that the message perpetuates the 'snobbish' North-South divide in London. A woman using the handle @isamyelyah said she would even be boycotting the cinema in response to the 'vile anti south London slander'. 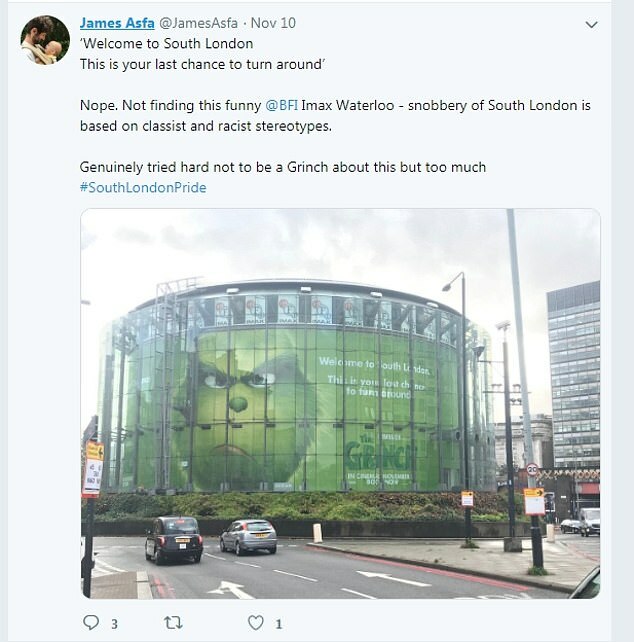 She tweeted: 'Will be boycotting the new grinch film due to vile anti south london slander on the giant ad for it on the waterloo roundabout imax'. 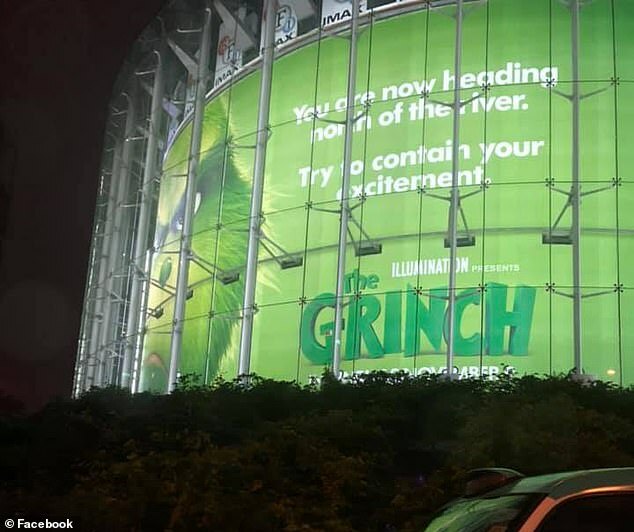 Replying to a tweet by The Grinch movie's official Twitter page, James Mattey voiced his displeasure at the advertisement. He said: 'Your advert on the Waterloo @IMAX suggesting that North is better than South London prevents me from seeing your film. Robbie Travers and others did find the message funny however, he said: 'Absolutely hilarious - get a life and a sense of humour'. 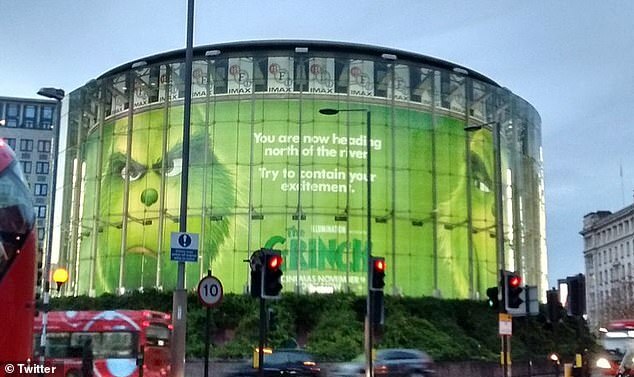 The drum-shaped cinema is wrapped by a 393 foot-long, 47 foot-high advertising canvas that gets seen by 3.5 million adults over two weeks, the highest adult reach of any single site in the country, according to its advertising sales partner Ocean Outdoor. The site is hugely popular with deep-pocketed brands that want to stand out and is said to cost in the region of £200,000 to book for a fortnight, including production, according to Campaignlive. The cinema is owned by the British Film Institute and run by Odeon, both have been contacted for comment.